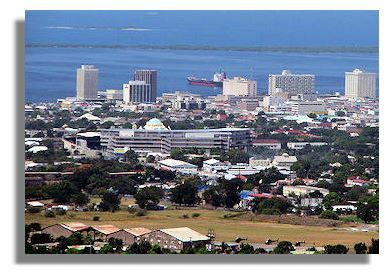 For comparability with other cities around the world, Kingston has been defined as the entire Corporate Area including and surrounding the Parish of Kingston together with immediately adjacent urban and semi-urban areas but excluding Spanish Town. This area takes in the Palisadoes on which Port Royal and the Norman Manley International Airport are situated and extends from Bull Bay, Dallas Mountain and Gordon Town in the east to Portmore and its suburbs in the west, and the Red Hills and Stony Hill in the north. Of the names of the 203 districts, neighbourhoods and suburbs that have been identified to date in Greater Kingston, 50 (24.6%) can be found in Scotland or are based on Scottish family names. Of course, many of the names are used in other parts of the British Isles as well, but at least 21 of them (10.3%) appear to have a direct or indirect link with Scotland. It may surprise some readers that the names of so many neighbourhoods and subdivisions in the Jamaican capital have a Scottish connection. Jamaica was at one stage a popular destination for settlers from all parts of the British Isles, including a large number of people from Scotland. In 1786 Scotland's national poet, Robert Burns, was in fact on the point of immigrating to Jamaica in order to escape his financial and other worries. However, the success of the Kilmarnock edition of his poems and the acclaim of his admirers induced him to stay in Scotland. Picture of Kingston via Wikimedia. Allerdyce Gardens - Black (1996), the authority on Scottish family names, does not give Allerdyce as a variant of the surname Allardice/Allardyce. There is, however, an Allerdyce Road and Drive in Glasgow. Allardyce is from the old barony of Allardice in Kincardineshire (now part of Aberdeenshire) evidenced today by a cluster of places called Allardice, Allardice Castle, Allardice Mains and Allardice Mill, a short distance inland from Inverbervie. The surname Allardyce is quite commonly encountered in the north east of Scotland. The family is a sept (branch) of Clan Graham of Menteith and so they are entitled to wear the tartan shown here. Balmagie - possibly a corrupted spelling of Balmaghie, the name of a small parish and a settlement within this parish in Dumfries & Galloway, in south-west Scotland. In former times, Balmaghie was the seat of the McGhee family. Billy Dunn - Dun or Dunn is a Scottish family name of territorial origin, perhaps from Dun in Angus. Dunn is the more usual form of this surname these days. Burnside Valley - there are several places in Scotland called Burnside (in Angus, Fife, Moray, South Lanarkshire and West Lothian). Burnside is one of the most commonly used Scottish names in cities around the world, 'burn' being the Scots word for a stream or creek. 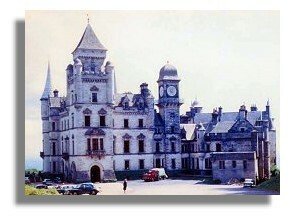 Dunrobin (Highland). Dunrobin Castle (illustrated here) in the far north of Scotland is the home of the Duke of Sutherland. Gordon Town - there is a place called Gordon in the Scottish Borders as well as many other places throughout Scotland with Gordon as part of the name, e.g. Gordonstoun, Gordonstown and Gordonsburgh. There is also a place called Gordon on the Isle of Man, the name possibly having been taken there by Scottish settlers. Gordon is an important Scottish family, which took its name from the village in the Scottish Borders. Subsequent to the family acquiring territory in northern Scotland, Gordon became the name of a region to the north of Aberdeen. The Gordon tartan seen most frequently is the regimental tartan of the Gordon Highlanders. According to Cundall (1909), Gordon Town, a settlement on the outskirts of Kingston "was formerly the property of a family of that name, but was not, as some suppose, connected with George William Gordon, of Morant Bay fame." For buildings and monuments named in honour of George William Gordon, see the paragraph below on National Heritage Trust sites in Kingston. Graham Heights - there are many places in central and southern Scotland beginning with Graham from the surname; also a few just over the border in Northumberland and Cumbria. The most famous bearer of this essentially Scottish name was the brilliant soldier James Graham, the 1st Marquess of Montrose (1612-50). Grants Pen - there is a place called Grant in Perth & Kinross. There are also many other places in Scotland with this Scottish family name as part of the name, for example Grantlodge, Grantshouse and Grantown-on-Spey. Places beginning with Grant can also be found in England but in the majority of these instances 'Grant' has a different meaning. According to Black (1996), Clan Grant is of Norman descent, the origin of the name being the French word 'grand' (great). It may interest readers to learn that place names based on this Scottish surname are frequently found in other parts of the Caribbean, for example Grant Town (Freeport, Bahamas) and Grants Town (Nassau, Bahamas). According to Tortello (citing Sibley, 1978), the Kingston neighbourhood was named for Sir John Peter Grant, "said to have been one of Jamaica's most competent governors, from 1866-74." Hamilton Gardens - Hamilton is the name of an important town in South Lanarkshire. The name Hamilton has been associated with Scotland since the 13th century, probably having been taken there by Walter Fitz Gilbert (Sir Walter de Hameldone). Hameldome/Hamelton was the name of Sir Walter's estate in England (either in Leicestershire or in Northumberland). According to the Penguin Dictionary of British Place Names (Room, 2003), Hamilton in Old English means 'farmstead in broken country'. Hamilton is one of the most frequently recurring Scottish place names around the English-speaking world. One wonders whether the Kingston neighbourhood was named for Lord Archibald Hamilton of Riccarton and Pardovan (1673-1754), Governor of Jamaica in 1714. Kintyre - the name of the 90 km (55 mile) long peninsula on the west coast of Scotland in Argyll & Bute, with the Atlantic Ocean to the west and the Firth of Clyde to the east. The name essentially means 'land's end' from the Gaelic ceann (head) and tir (land). Pitcairn Valley (Pitcairn in Fife and Perth & Kinross). The surname is recorded in Scotland as far back as the 13th century. Port Henderson and Henderson Hills - there is a Henderson's Rock in Argyll & Bute as well as a Henderson's House in Durham, England. Henderson (meaning 'Henry's son') is a Lowland Scottish family name. Clan Henderson (their tartan is shown here) once held lands in Upper Liddesdale but were not included in the 1594 Act of the Scottish Parliament, which sought to impose law and order on the Border Reivers. According to the Portmore Web Site, the name is a tribute to John Henderson, who developed Port Henderson in the 1780s, with government aid, in response to the need for a better port for Spanish Town since Passage Port had become silted. Cundall's (1909) explanation of the origin of the name provides a clear link with Scotland: "[Port Henderson] is named after a former owner, John Henderson, Colonel of militia, who was presented at court in February 1784. He died at his estate in Scotland in 1811. It was founded in opposition to Passage Fort, as it afforded better accommodation for ships." Portmore, Portmore Gardens and Portmore Pines - there is a Portmore House and Portmore Loch in the Scottish Borders. Portmore was also one of the earlier names for St Fillans in Strathearn, Perthshire. However, Portmore is also the name of a place in Hampshire, southern England as well as the name of a farm in Devon. Portmore was once a Scottish peerage title. The title was created in 1703 for David Colyear, but became extinct with the death of Lord Thomas Charles Colyear, the 4th Earl of Portmore, in 1835. According to the Portmore Web Site, James Colyear Dawkins, the owner of Portmore Pen, was most likely the person who named the community after his uncle the Earl of Portmore, in which event a Scottish link can be claimed. Rae Town - according to Ancestry.com, Rae is a reduced form of MacRae or McRae, a Scottish family name. An article published in The Gleaner on 7 December 2009 states that "Rae Town, Kingston has the singular distinction of being the only community in Jamaica whose name is synonymous with the music event it has hosted for nearly 30 years, organised by 'Miss Norma' around the Capricorn Inn." Rennock Lodge - Black (1996) lists a few examples from the 17th century of the family name Rennoch. The name of the Kingston neighbourhood might therefore have a Scottish origin, despite the slight difference in spelling, especially since it does not seem to occur elsewhere in the British Isles. Sterling Castle - the inclusion of 'castle' in the name of this neighbourhood suggests a reference to Stirling Castle (seen below) in central Scotland, whether directly or in the form of a pun. Stony Hill (Aberdeenshire, East Ayrshire and Moray). Although this name is also found in southern England, the Kingston suburb, according to Tortello, apparently takes its name from a house in Scotland. Braeton, Braeton Newtown and Old Braeton - There is no place anywhere in the British Isles with this name. However, the 'brae' element in the name of this community near Portmore suggests a possible Scottish connection, 'brae' being a Scots word for a hillside or slope. There are hundreds of places in Scotland containing 'brae' as part of the name; about the closest sounding of these to Braeton is a small settlement in Highland, near Ben Tongue, called Braetongue. As a family name, however, Braeton is more likely to be English. Calder - the name of minor rivers in Highland and Renfrewshire; Calder Water in North Lanarkshire gave its name to Calderpark in Glasgow, the site of the former Glasgow Zoo. It is not certain whether the Kingston neighbourhood necessarily has a Scottish name since Calder also occurs in northern England, e.g. the well-known River Calder in Lancashire. Considering the location of Calder in a part of Portmore where most of the names of the adjacent subdivisions are taken from well known race courses (Aintree, Belmont Park, Daytona, Epsom, Monza, Queens Park, Sandown Park and Silverstone), it is very likely that Calder was named for the Calder Casino and Race Course in Miami Gardens, Florida, built by real estate developer Stephen A. Calder in the early 1970s. As a family name, Calder could be either Scottish or English. Fletcher's Land - Fletcher is certainly a Scottish family name. There is a Fletcher tartan and there is also a Fletcherfield in Angus possibly associated with the Fletchers of Innerpeffer. Since the origin of the name is purely occupational (meaning arrow-maker) it is hardly surprising that Fletcher is also found as an element in at least twelve place names throughout England, for example Fletchersbridge in Cornwall and Fletcher's Combe in Devon. Fletcher is also a relatively common English family name. Gregory Park - as a family name, Gregory is considered to be both Scottish and English. The Scottish family is a sept of Clan MacGregor. Hermitage - there are places called Hermitage in Dumfries & Galloway, the Scottish Borders (that's Hermitage Castle shown on the right) and the City of Edinburgh. 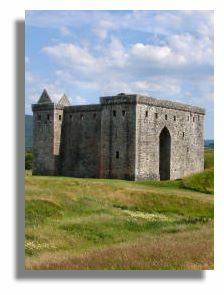 However, Hermitage occurs even more frequently throughout England and is also found in Wales. Kirkland Heights (Kirkland in Aberdeenshire, Dumfries & Galloway, East Renfrewshire, Falkirk, Fife, Moray, South Ayrshire and South Lanarkshire, with more than one occurrence of the name in some counties). There are in fact at least 50 places in the Lowlands of Scotland with Kirkland as part of the name, other examples being Kirklandhill in the Scottish Borders, East Lothian and South Ayrshire, and Kirkland Glen in North Ayrshire. Records of Kirkland as a family name in Scotland go back to the 13th century. However, Kirkland also occurs fairly commonly as a place name in northern England, especially in Cumbria where it is encountered just as frequently as in the neighbouring Scottish county of Dumfriesshire. Kirkland is a name of Norse (Viking) origin, meaning 'estate belonging to a church', 'kirkja' being the Viking word for church. Viking settlement resulted in hundreds of place names in southern Scotland and northern England containing 'kirk' as an element in the name. As a family name, Kirkland is equally likely to be either Lowland Scottish or northern English. Mary Browns Corner - there are numerous places in both Scotland and England that appear to be based on the family name of Brown. The surname Brown is very common in both countries, with surveys in the 1970s suggesting that it is the second most common family name in Scotland (after Smith) and the third most common in England (after Smith and Jones). Mount Pleasant (Aberdeenshire, Argyll & Bute, Scottish Borders, Dumfries & Galloway, East Ayrshire, Fife, Highland, Moray and the Orkney Islands). This name is also found all over England, Ireland and Wales, as well as Australia, Canada and the USA. Mountain View Gardens - there is a Mountain View in the Scottish Borders as well as in Cumbria, northern England. This is likely to be a purely descriptive name, however. New Haven (City of Edinburgh, spelt Newhaven) also three places in England called Newhaven. However, this may simply be a descriptive name with no intended reference to either Scotland or England. Newlands (Scottish Borders and City of Glasgow) but is also frequently used as a place name in England. The illustration is of Newlands Park in Glasgow. Newport East and Newport West - there is a Newport in the former Scottish county of Sutherland but the name also occurs in England, Ireland and Wales - Newport is Wales' third largest city and is also one of the best-known towns on the Isle of Wight in southern England. Either of these places had a greater chance of influencing the choice of name of the Kingston neighbourhoods than did the small Scottish village. 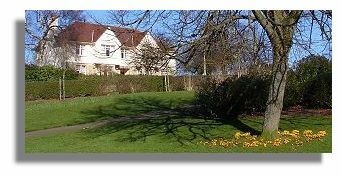 Russell Heights - there is a Russell Mains in Fife but Russell is far more commonly encountered in place names throughout England and there is also a Russell Hill in Monmouthshire, Wales. Russell is nevertheless a fairly common Scottish surname, derived from 'rous' meaning red. The earliest reference in Scotland to this name is in 1164. The Scottish Russells have their own family tartan. Seaview Gardens - there is a Seaview in Highland as well as in two English counties. This is no doubt a purely descriptive name. Springfield (Argyll & Bute, Dumfries & Galloway, Fife, Highland and Perth & Kinross) but this name is found even more commonly in England and is also used in Wales. A descriptive name, Springfield proved to be particularly popular in the USA. Tower Hill (Aberdeenshire and Inverclyde) but far more commonly found throughout England. Westbay (Argyll & Bute and Inverclyde, both spelt West Bay) but there is also a West Bay in Dorset, England. Since this neighbourhood is in Portmore, which is situated on the west side of Kingston Harbour, the name is probably descriptive of its location. Westport (Aberdeenshire and Argyll & Bute) also in Somerset, England and County Mayo, Ireland. Like Westbay (see above), the name of this Portmore neighbour is probably purely descriptive. Whitfield Town (Whitfield in Dundee City) also in England. Since Whitfield is an English family name, the chances of a Scottish connection with the Kingston neighbourhood are greatly reduced. A final category of names comprises places that can be found in Scotland but which, in Kingston's case, definitely or most probably have no Scottish connection. Belmont Park - there are places in the Scottish Borders, Shetland Islands and South Ayrshire called Belmont, French for 'beautiful mountain'. However, Belmont is also found all over England and in Ireland and Wales (there are at least 22 places called 'Belmont' in the British Isles, including the three in Scotland). Considering the location of Belmont Park in a part of Portmore where most of the names of the adjacent subdivisions are taken from well known race courses (Aintree, Calder, Daytona, Epsom, Monza, Queens Park, Sandown Park and Silverstone), it is very likely that Belmont Park was named for the famous New York race course, in which event a Scottish connection is unlikely. Hope Estate and Hope Pastures - Hope is an element in numerous Scottish place names, for example Hopetoun House in West Lothian and Hopefield in East Lothian. Hope is also a noble Scottish family name, the family being descended from John de Hope who probably came to Scotland from France in the 16th century with Magdalen de Valois, the wife of King James V. However, Hope is also considered to be an English family name from Derbyshire and many place names in England have Hope as part of their name. According to Cundall (1909), Hope Estate takes its name from one of the early soldiers of fortune who accompanied Admiral William Penn and General Venables when Jamaica was seized from the Spaniards in 1655; it is therefore more likely to be an English name rather than a Scottish one. Kingston - there are many places in Scotland called Kingston (in Angus, City of Glasgow, East Lothian, Moray and Renfrewshire). However, places called Kingston can also be found all over southern England and in Ireland and Wales as well. Like the vast majority of places called Kingston throughout the former British colonies, Jamaica's capital city was named in honour of royalty rather than after a particular place in the British Isles. In the case of Kingston, Jamaica, the name honours King William III, a Dutch prince of the house of Orange who, together with his wife (Mary, of the house of Stuart), was joint sovereign of the kingdoms of England and Scotland in the 1690s. The city's name therefore has no Scottish connection. 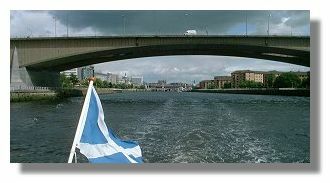 Kingston Bridge in Glasgow (illustrated here) is named after a docklands area of the city which in turn may have taken its name from Kingston, Jamaica in the days when ships sailed regularly from there to the West Indies. New Kingston - this neighbourhood takes its name from the city of Kingston (see above) and therefore has no Scottish connection. Mona Heights - there is a Mona Gowan in Aberdeenshire and Monaween in Angus. However, there is also a Mona Hill in Norfolk, England, and Mona is the Latinised Welsh name for the Isle of Anglesey. The origin of the name is indeed the Roman name for the Isle of Anglesey, according to an article retrieved from Wikipedia in June 2011, which makes this a Welsh rather than a Scottish place name. Queens Park (City of Glasgow) also in England. However, as in the case of Belmont Park and Calder (see above), the Portmore subdivision is very likely to have been named for a well known race course, possibly the one in Grenada. At least four National Heritage Trust sites in Kingston have Scottish connections, or names suggesting a Scottish connection: the Scots' Kirk, St William Grant Park, Gordon House and the George William Gordon Monument. George William Gordon (1815-1865), businessman, politician and national hero, was the son of Joseph Gordon, a Scottish planter and Ann Rattray, a mulatto slave. A leading critic of the policies of Governor Edward Eyre, Gordon was executed after the Morant Bay rebellion, an act of the governor which caused controversy in Britain. Gordon House, the official meeting place of the Jamaican Government since 1960, was also named in honour of George William Gordon (Jamaica National Heritage Trust). St. William Grant Park (formerly Victoria Park), was named after Jamaican labour activist William Wellington Wellwood Grant (1894-1977). His surname suggests the probability of a link with Scotland, either by descent or by adoption of the name of a plantation owner. The St. Andrew's Scots Kirk, rebuilt after the 1907 earthquake, is Jamaica's principal Presbyterian Church (Jamaica National Heritage Trust). Scottish place names are found all over the island nation of Jamaica. Obvious Scottish examples outside Greater Kingston include Aberdeen, Clydesdale, Culloden (two places), Duncans, Dundee, Elgin Town (two places), Farquhars Beach, Glasgow, Grants Town, Inverness, Kilmarnoch (spelt that way), Perth Town, Stewart Town and Tweedside, to mention but a few. Two other Jamaican cities, Montego Bay and Spanish Town, also have several neighbourhoods with Scottish names, for example Dunbar Pen, Glendevon and Pitfour in Montego Bay and Ellerslie in Spanish Town, while the parish of St Andrew, in which many of Kingston's neighbourhoods and suburbs are located, was named for the patron saint of Scotland. Of course, names of English origin are dominant throughout the island. However, there is also a good sprinkling of Irish, Welsh and Cornish place names, but not nearly as many as those of Scottish origin. Cundall, Frank (1909). Jamaica Place-Names. (The Institute of Jamaica, Kingston). Jamaica National Heritage Trust website. Jamaica Road Map, 2001 (International Travel Maps, Vancouver, Canada). The Portmore Web Site for a list of subdivisions in Portmore and its Portmore 40th Anniversary page for information on the likely origin of the name Portmore. Sibley, K. I. (1978). Dictionary of Place-Names in Jamaica. (The Institute of Jamaica, Kingston). Tortello, Rebecca. What's in a Name?